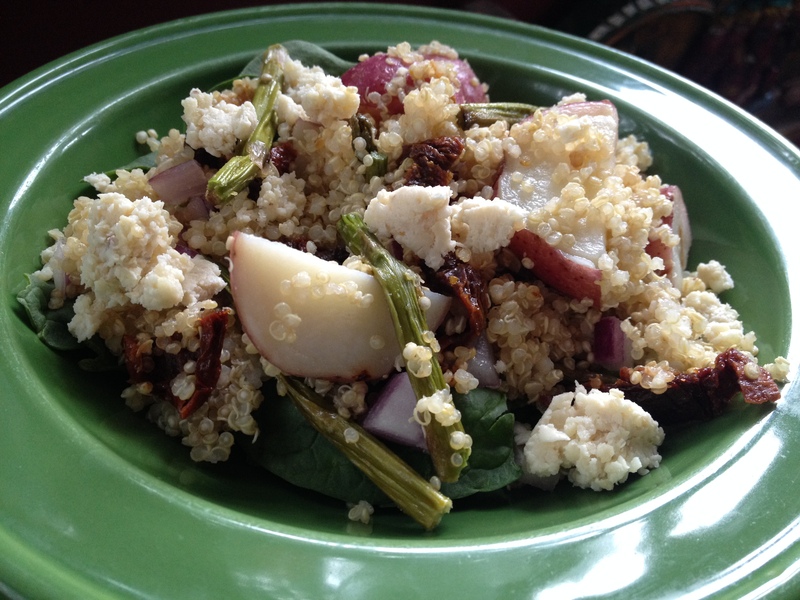 Ashley is back with a recipe today for a quinoa & potato salad. We’ve been having a blast this week with all of our Vegan MoFo posts, and Ash is rocking her Insanity workouts!! I’m totally loving how creating all of these recipes for Vegan MoFo has got me spending more time in the kitchen. Mr. KitchenOperas and I have been eating pretty well around here. I can’t wait to try Ashley’s salad — I’ve really been enjoying warm salads lately (Heather and I had another taco salad last night with warm chickpeas), so I’m looking forward to the warm veggies in this one too! Also… cashew feta? Mmmm. Boring meals don’t interest me and sometimes salads fall into that category. People like to remind me that ‘you can’t make friends with salad’, but I like proving that theory wrong!! I am a huge fan of awesome salads with exciting ingredients and can be one of my favourite meals to pack for lunch. I love starting off with delicious vegetables, especially those that are in season. Having an exciting lettuce like baby spinach or baby kale helps too! I like adding quinoa, beans or tempeh to kick up the protein and make everything more filling. Sometimes I will sauté different veggies and add them to my salad creations too. I find that warm things satisfy me more, especially as we head into fall. 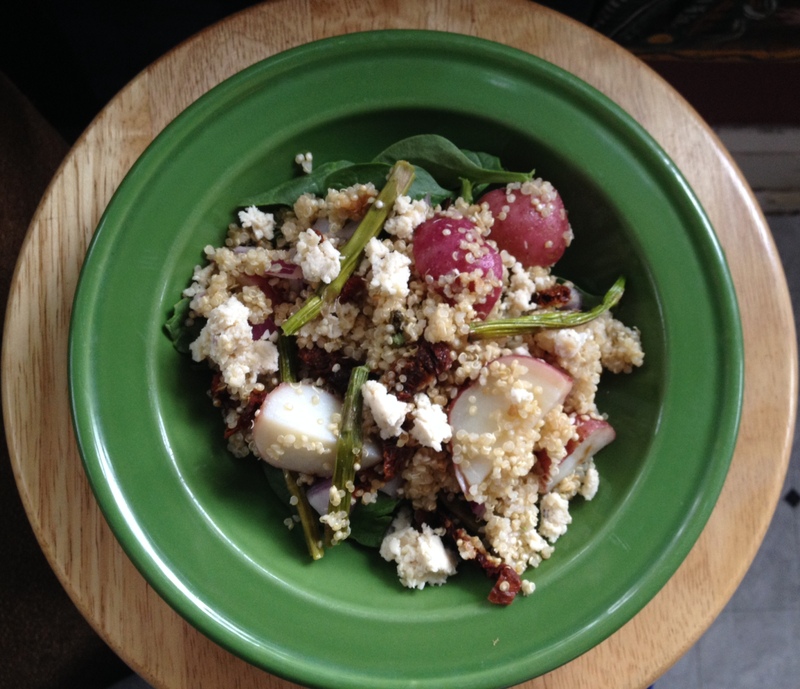 Yummy veggies + protein + something warm = a winning salad combination for me! I had been plotting ideas for this salad all week and I really enjoy how all of the flavors came together. It would be an easy one to throw together if you already had some cooked quinoa on hand, and had some leftover potatoes from the tasty Potato Leek soup from yesterday’s post. It’s great hot or cold, depending on your preferences or circumstance. My roommate did a dance of joy when he had a bite, so I think that’s a pretty great endorsement of its deliciousness. Mix Salad ingredients (except baby spinach) together in a large bowl until well combined. Add Cashew Feta ingredients to a food processor and blitz. Stop to scrape down the sides and process until you reach your desired consistency. For this salad, I like to leave the cashew mix a bit chunky to give it some texture and make it easier to crumble atop the salad. Mix up the Dressing: add ingredients to a jar and shake until smooth. To assemble the salad: add a few handfuls of baby spinach to a bowl. Top with quinoa & potato mixture. Drizzle dressing over top. 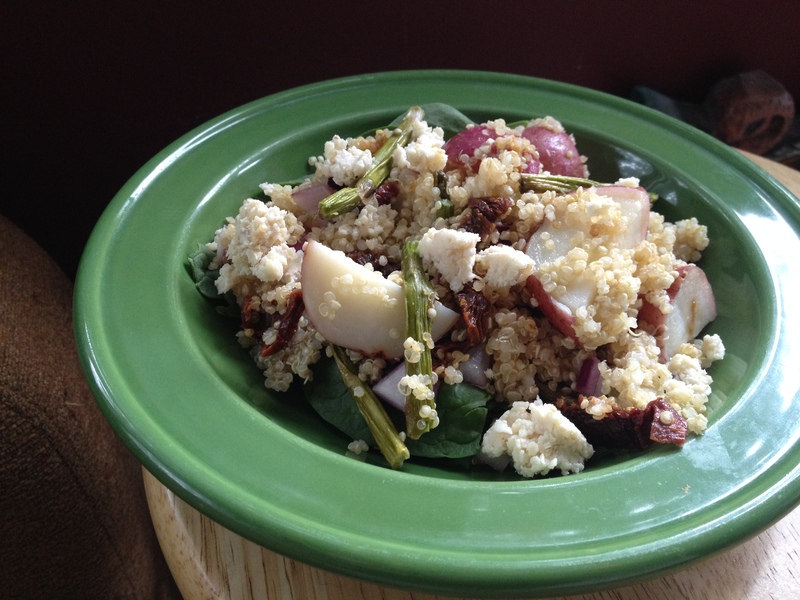 Crumble some of the cashew feta to complete the salad and enjoy!